. Sanuki Udon noodles 讃岐の食文化 ー The Udon Prefecture うどん県 .
. Yashima Gassen 屋島合戦 The Battle of Yashima . 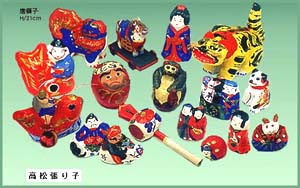 They were a present at the birth of a girl and during the Hinamatsuri festival in March. 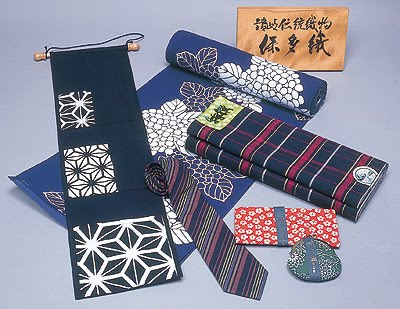 Special patterns were the chrysanthemum, plum blossom, pine needles or the hemp flower. The colors of the cotton threads were achieved with natural dyes. 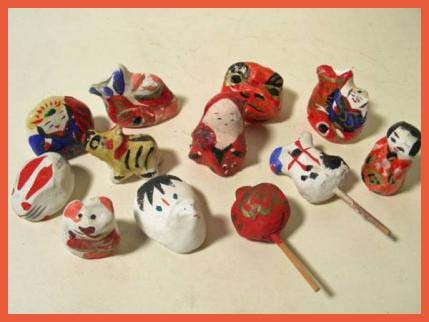 Now they are well-loved souvenir, rather than a toy for the girls.
. temari 鞠（まり）-手毬（てまり）hand ball, rag ball .
. hariko no tora 張り子の虎 papermachee tiger .
. Sanuki no hanakago 讃岐の花かご flowerbasket, flower basket . 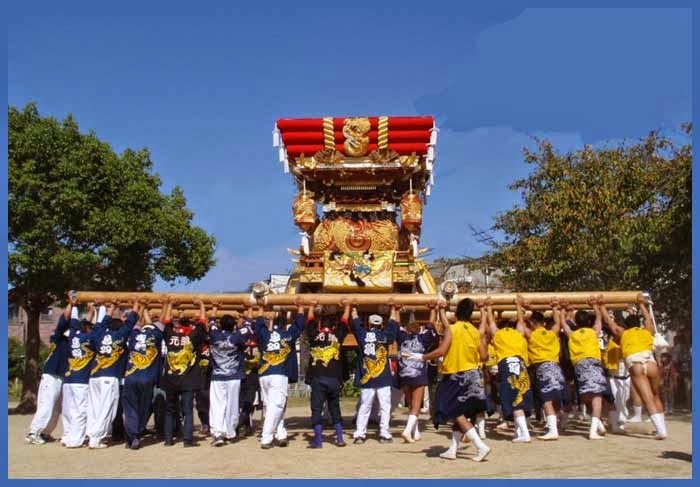 Marugame was once the first access to Shikoku Henro pilgrims and Konpirasan pilgrims coming from the Main Island of Japan. 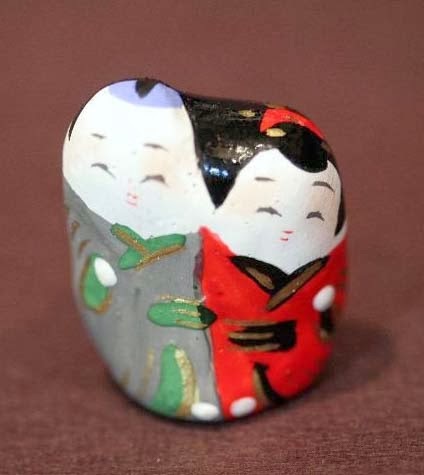 The Sumiyoshi San brings good luck - 福招き fuku maneki . 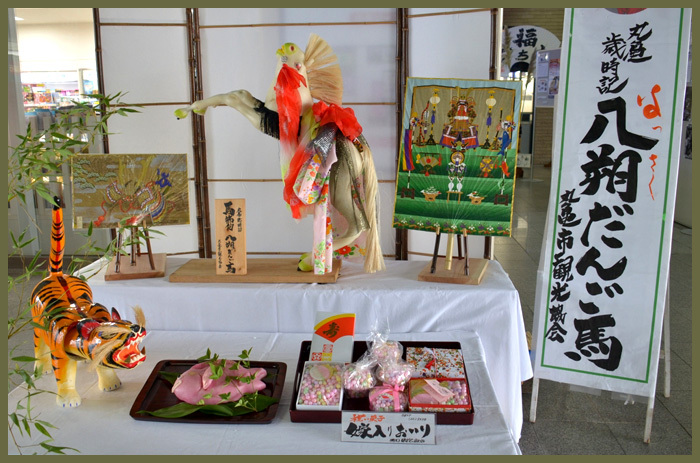 It was sold on the third day of the New lunar Year at 威徳寺毘沙門天 the temple Itoku-Ji in honor of Bishamon Ten.
. Sumiyoshi Jinja 住吉神社 The Sumiyoshi Shrines . In 1591, Toyotomi Hideyoshi ordered the marine of Shiwaku to help with his campaign against Korea. 32 ships with 650 people joined the battles and eventually came back sucessfully. When they returned home, old and young, men and women of the island danced for three days, filled with joy.
. The Salt-boiling Islands, Shiwaku Shotoo (塩飽諸島) . They have been made since the beginning of the Showa period. Often a square and a circle are added together, with a black or purple colored frame. 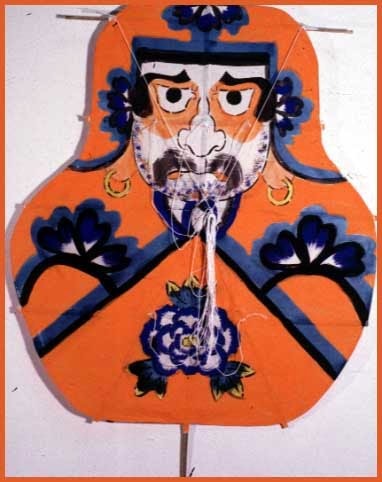 The painting on the kite often shows warriors. They are all made to withstand strong winds. Marugame uchiwa　丸亀団扇 handfans from Marugame and more . . .
. danjiri futon floats .
. Jooganji no Hage Tanuki 浄願寺の禿狸 bald Tanuki from temple Jogan-Ji .
. Konpira deko 金比羅でこ head dolls from Konpira san .
. Konpira inu 金毘羅　狗　dog from Konpira .
. matsuribune, matsuri fune 祭り船 festival boat - on wheels . They are made from papermachee, covered with laquer.
. Takamatsu musha ningyoo 武者人形 Samurai Dolls .
. nenbutsu, nembutsu 念仏 prayer ceremony for Amida .
. Sugawara Michizane 菅原道真 Tenjin Sama and Amulets . Made by the papermachee doll makers of Takamatsu. 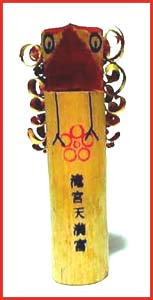 宮内まさえ Miauchi Masae san is a famous maker. Other makers are 乃村タツ子 and 大崎豊五郎.
. undoo ningyoo 運動人形 dolls doing exercises dolls . 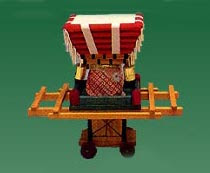 The female doll wears a red head scarf. 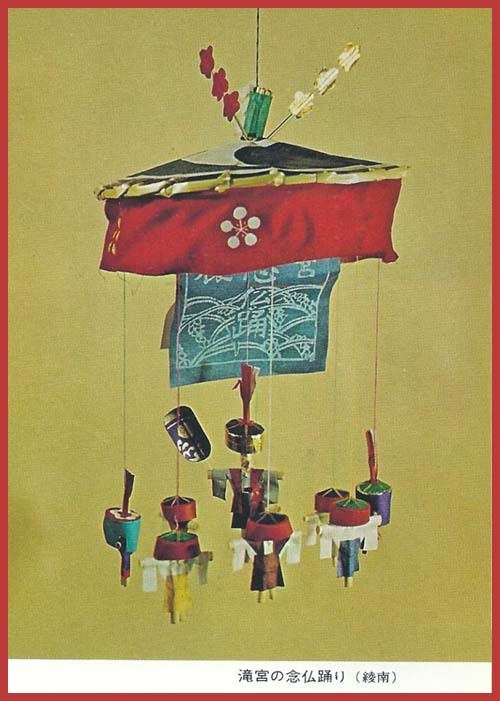 "Hera, Hera Hei Odori" is the title of a popular Meiji era song. The dance that went with it gave rise to fashioning of the illustrated doll.
. yome-iri ningyoo, yome-iri 嫁入人形 dolls for a bride . 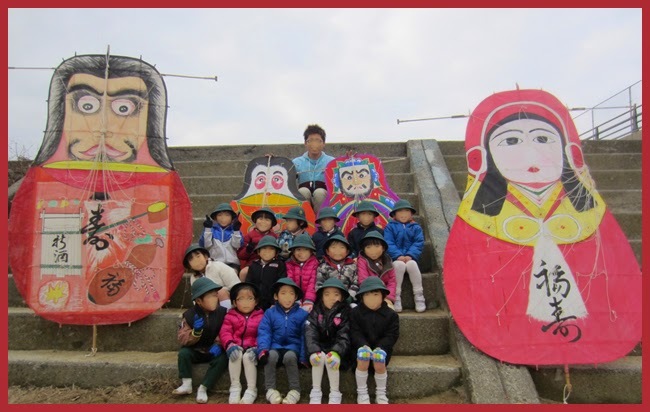 Beside Shizuoka, Tamamatsu kites are among the most famous in Japan. 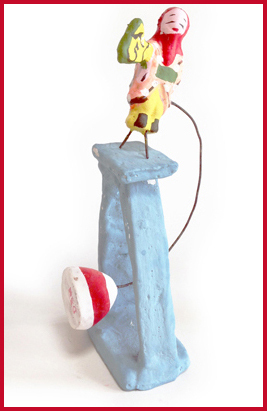 The skillfull craftsmen from the region have made various forms. 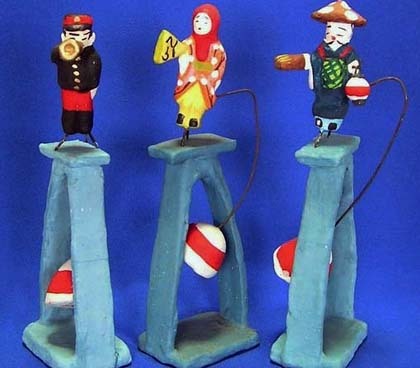 They are made from strong bamboo and local paper and can withstand the seasonal winds. 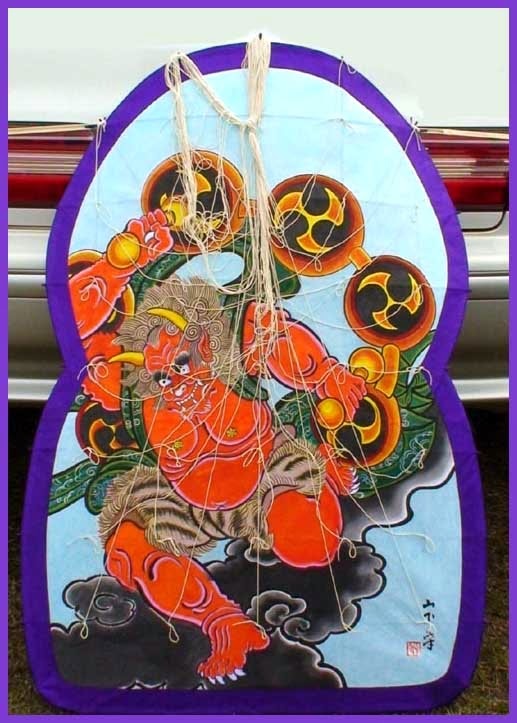 In Takamatsu, the Daruma kite is on of the best. 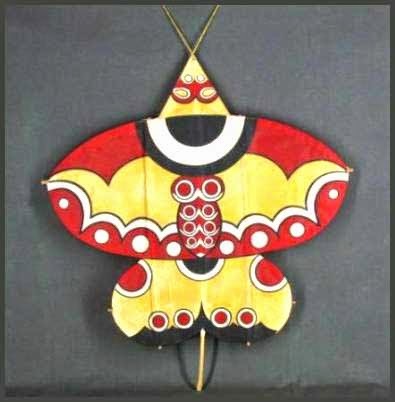 In May, the garden's Folkcraft Museum featured beautiful old kites. 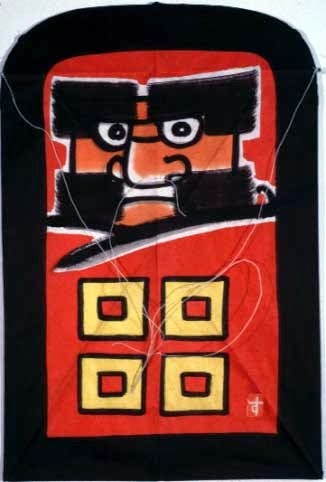 The kites and banners featured heroes from Japanese folktales and warriors from famous battles, such as the Genpei Wars of the 12th century.
. Yakuri no Daruma 八栗のだるま. "yakuri (yaguri)," meaning "eight chestnuts"
The big ones can be up to 50 cm. 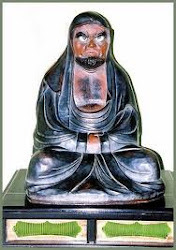 In former times the Lord Hosokawa 細川越中の守 resided in Nio Castle, but when the castle was raided by Choso Kabe 長曽我部 it fell on the 3rd day of the 3rd lunar month (the date of the Girl's Hina Festival) and Hosokawa comitted suicide. After his death a strange creature was destroying the fields, said to be the vengefull soul of Hosokawa. 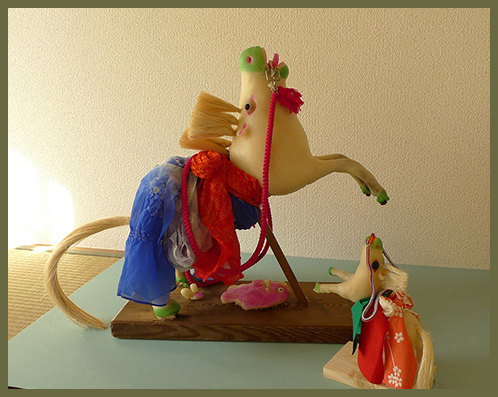 To appease him, people made the horse sweets シシコマを団子.
. hassaku - first day of the eighth lunar month . bota means to last for many years. 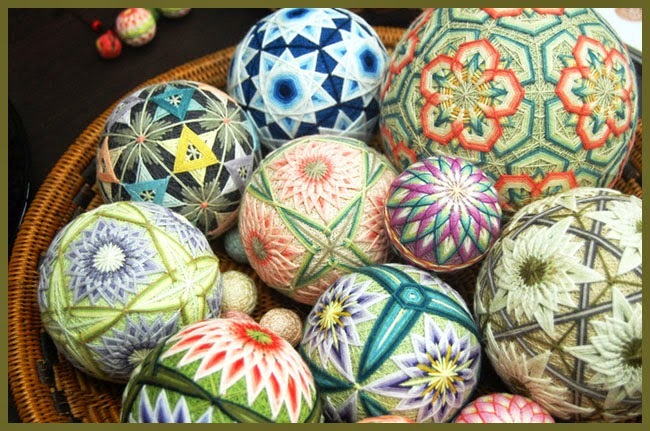 Weavers from Kyoto brought the skills to Takamatsu at the end of the 17th century. 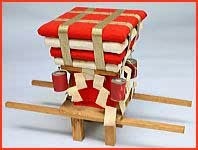 It is light and feels soft so it has been used for kimonos, summer kimonos and wrapping cloths through the ages. Recently, it is used for daily shirts, blouses and handkerchiefs. 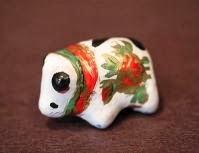 Here in Takamatsu, Kagawa Lacquer Ware has been observed as a national treasure. This is the method of engraving lines of patterns onto a bowl then putting colored lacquer in the gap. After drying, it is polished. 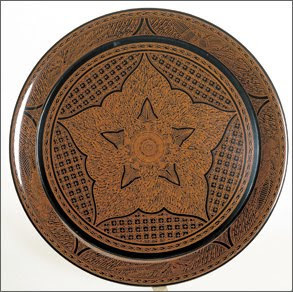 The gorgeous patterns are said to be the king of Kagawa Lacquer Ware. This is the method of coating several layers of lacquers onto a surface then engraving it with a knife to bring out the color you would like to appear creating beautiful line patterns. It is widely known with interiors. This is the method of drawing patterns on the surface of black or red finished lacquer ware using different colors of lacquer. Main lines and main parts of a picture are then carved with a knife, and very fine lines are carved to finish up. 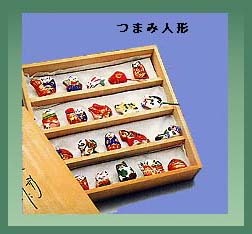 It is popular for furnishing goods and daily goods such as containers used to keep tea tools; as well as serving trays. This is the method of coating a surface with lacquer several times, and then putting powder made from makomo, a gramineous plant that grows near the water, to finish it up. It is used for saucers, teacups and trays; and it gains elegance as you use it. This is the method of coating a surface twice. A second coat of lacquer with a little bit of color is added to the red lacquer to give a look of elegance. It is then coated with a transparent lacquer to finish it up. 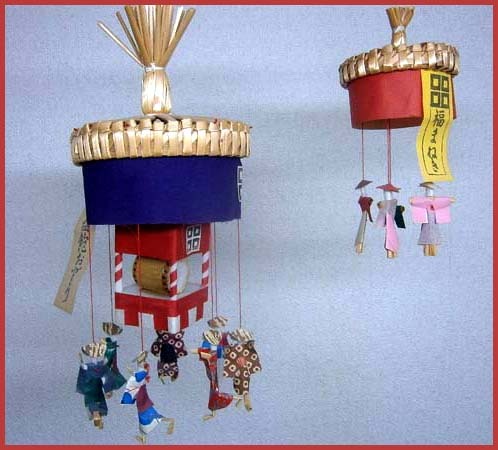 This method of lacquer is often used for low tables which become more elegant as time passes.
. wadako 和凧 Japanese kite - Introduction .
. Kagawa Folk Toys - this BLOG .